The NG (New Generation) Dump Body Control is for operation of pumps, hydraulic spool valves, and PTO’s. Designed and manufactured with World Class techniques, this control combines rugged steel components, heat treated in critical areas, with a simple modular construction to produce a “New Generation” of mechanical control products. This new line of products combines the strength and reliability of our current mechanical controls with the latest in manufacturing technologies to produce a high value control system for our customers. 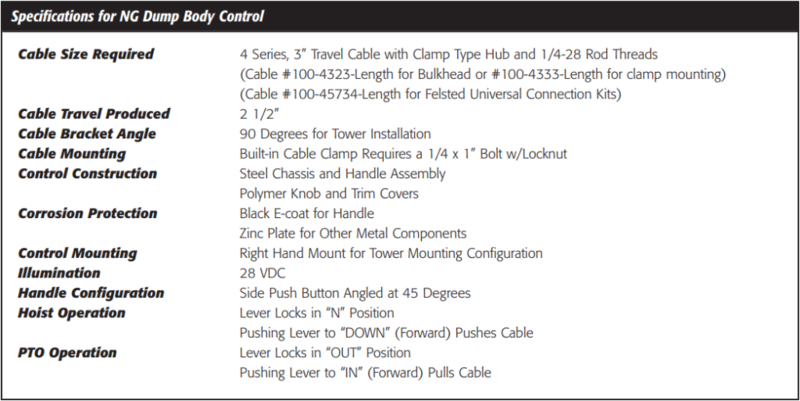 As an added feature for easy installation, we have incorporated a quick connect cable mounting system into this control. Utilizing a clamp built into the cable mounting bracket, the assembler needs only a standard 1/4 x 1” bolt and locknut to attach the cable to the control. This allows faster assembly of the cable, while using common mounting hardware available anywhere. Just like the T-Handle unit, this Dump Body Control features a positive locking detent system which minimizes the possibility of the control being unintentionally bumped or knocked out of detent. 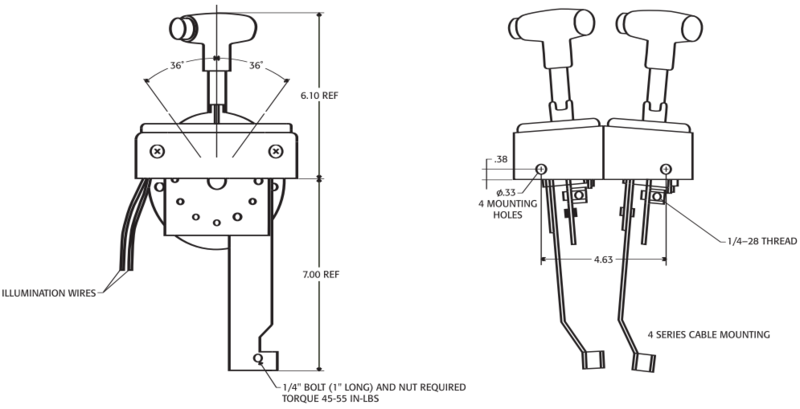 The Hoist Control locks in “N” (neutral) position and the PTO locks in “OUT” position. To release from detent, just push in on the side push button and move the lever to desired position. The illuminated position strip and lever indicator provide position range indication day and night.